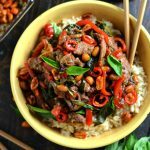 I truly hope, if we’re to remain friends and all, that you agree that there can never be too many Thai recipes. Or taco recipes. Or pretty-much-anything-you-can-think-of recipes, because I just don’t get sick of foods that easily. Also, if we’re on the subject of staying friends, I hope that you’re okay with making some decisions ’round here because I am a notorious “I don’t know, whatever you want”-er. In fact, I’ve recently realized that my go-to decision (if you can call it that) is both, as in “I don’t know if I want Maki Combo A or B, and you’re not sure what you want, so let’s get both and split it.” I just can’t rule anything out that seems like a good option. I promise it’s not because I’m lazy or lackluster, it’s just because I like everything so much. Too much. Like Thai food. And tacos. 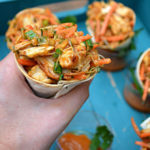 So, as you can tell, when I recently had leftover Thai Spicy Peanut Sauce but had planned to make taco appetizers, I had a little internal struggle that resulted in the creation of Thai Chicken Taco Cones. We can pretend this is what I meant to do all along since fusion foods are such a thing right now, right? Thanks, pal. Luckily, they turned out to be much better than I imagine my original plan would have, and I’ve had several requests to make a second batch of these easy appetizers. Between the great flavors and fun taco-cone presentation (or should we call them “Tacones”? ), these really are a treat to have at get-togethers. I decided to use plastic cups I had leftover from another recipe in order to help them stand upright, and I included a little extra sauce in the bottom of the cup just in case anyone wanted to pour on some more. You can always also use something like this Cone Server to display your cones too, but you’d have to make meal-sized ones instead of appetizer-sized ones since the servers are bigger. 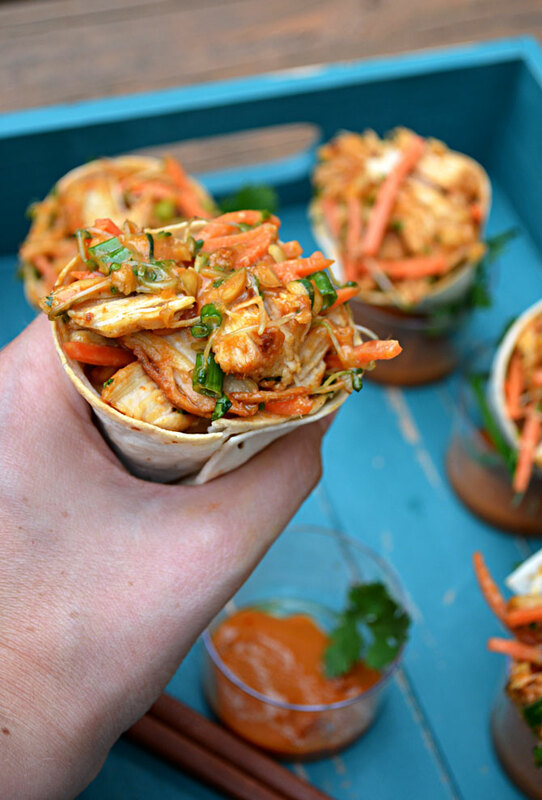 Make these Thai Chicken Taco Cones for a fun and flavorful appetizer that everyone will love! Preheat oven to 350 degrees F. Cut the tortillas in half and then roll them to form a cone shape. Secure the sides with a toothpick. Stand the cones upright on a nonstick baking tray and bake 7-10 minutes or until lightly golden and crisp. Remove toothpicks. Mix the remaining ingredients in a large bowl. 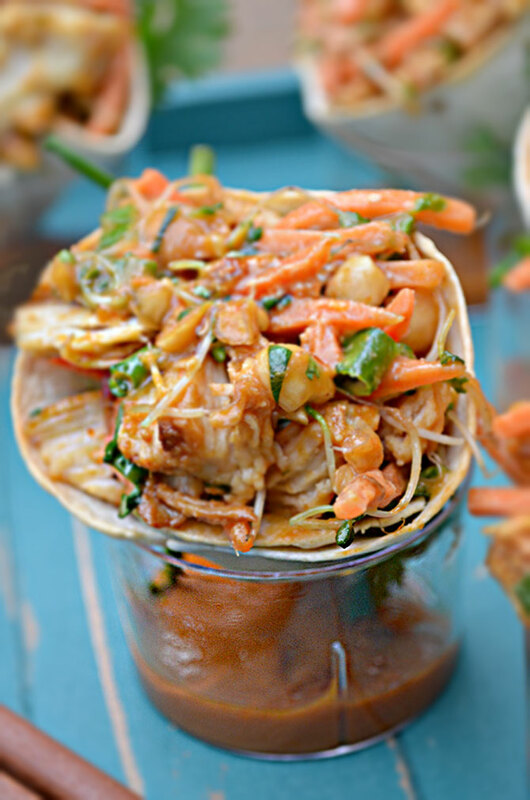 When adding the peanut sauce, start with just a bit to slightly saturate the chicken. 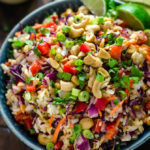 You will have to add to taste, but don’t overdo it– the peanut sauce can overpower the chicken if you add too much (I learned the hard way with my first try)! 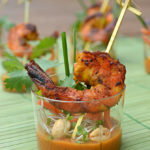 Less is more, and you can always add extra peanut sauce on the side or in the cups if people want it. 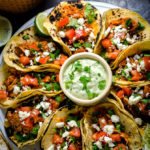 When your ingredients are well-mixed, spoon the mixture into the prepared taco cones. Serve.